The cookbook that I adapted this from claimed that this was one of Cambodia’s most popular dishes. I’m not so sure I believe that, considering I didn’t see any similar recipes in other Cambodian cookbooks, or even online. But I was intrigued enough of with the idea of cooked cucumber in the curry that I decided to give it a go. Until then I’d never even considered eating cumbers in a non-raw state. The verdict? Surprisingly good. 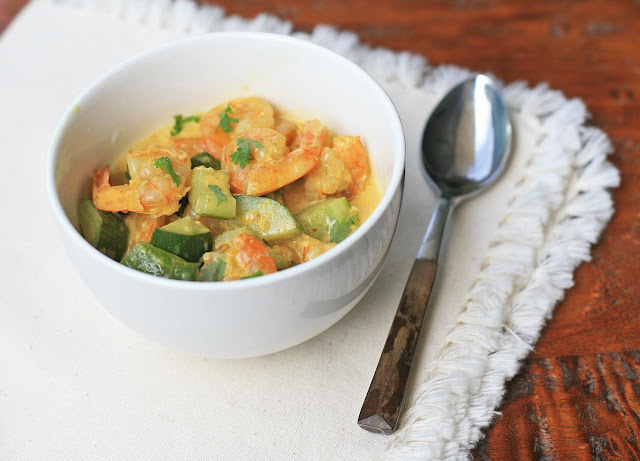 The shrimp and cucumber, which is cooked just beyond the tender-crisp stage, keeps things nice and light to balance out the rich coconut sauce. And you’ve got two options for the sauce. You can use a whole can of coconut to get a nice and soupy curry, which would saturate and flavor the bed of rice, or cut back to make things a less saucy. Place the garlic, shallot, green onions, ginger, fennel, coriander, turmeric, and cayenne in a blender or food processor and process until smooth. Heat the oil in a large skillet or saucepan over medium-high heat. Add the spice paste and fry for 3-5 minutes. Add the shrimp and cook, stirring frequently, until they’ve turned pink. Stir in the coconut milk and bring to a boil. Add the cucumber, lemon juice and zest, palm sugar and fish sauce and cook, stirring occasionally, until the shrimp are cooked through and the cucumber has softened. Serve atop a bed of rice and sprinkle with chopped cilantro, if desired.